U.S. 'Ought To Respect' State Marijuana Laws, Sen. Leahy Says : The Two-Way Sen. Patrick Leahy is asking the Justice Department to clarify its policy on state marijuana laws that clash with stricter federal rules. Leahy's been seeking answers ever since Washington and Colorado voters approved marijuana for recreational use last year. Sen. Patrick Leahy is calling on the Justice Department to state its position on marijuana's legal status. 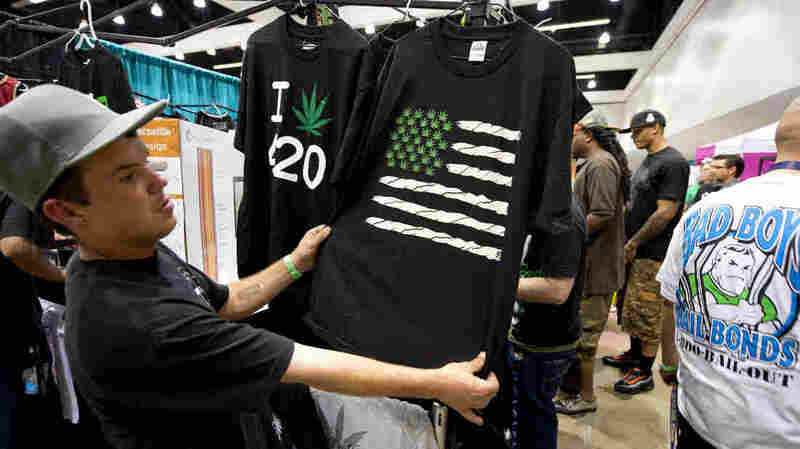 Here, a man inspects a shirt depicting the U.S. flag made of marijuana symbols, at a medical marijuana show in Los Angeles earlier this year. The Chairman of the Senate Judiciary Committee says he's done waiting for answers about how the Justice Department will handle marijuana offenses in states that have legalized small amounts of the drug. Vermont Democrat Patrick Leahy has asked Attorney General Eric Holder or his deputy to appear at a Sept. 10 hearing on Capitol Hill — and to be prepared to state the Obama administration's policy on the issue. Leahy's been asking questions ever since Washington and Colorado voters approved marijuana for recreational use in last year's elections. Holder has said for months that the Justice Department is studying how it will handle the state initiatives. And the Office of National Drug Control Policy hasn't responded to Leahy's now months-old letter asking about the issue, the chairman said. "There's only so many resources," Leahy told NPR in a telephone interview. "And to waste time on going after simple marijuana cases in states where it's either been legalized, or legalized for medical uses, seems like a bad use of our limited law enforcement dollars." Leahy says federal authorities should devote time to cracking down on violent crime and deadly drug cartels — and he says he wants assurances that state officials will not face criminal jeopardy for carrying out their duties to license marijuana exchanges in the 20-odd states where marijuana is legal for medical purposes. "The federal government ought to respect" these decisions by states, Leahy says. The conflict stems from the 1970 federal law known as the Controlled Substances Act, which continues to include marijuana among its Schedule I drugs — the most tightly regulated substances, considered to have a high potential for abuse and no currently accepted medical use. In recent years, coalitions of drug reformers, including some former law enforcement officers, have called for a looser approach to regulating marijuana. But that stance has been unpopular, especially within the Drug Enforcement Administration. Leahy says he'll use the hearing next month to explore whether the change can be accomplished through executive branch action or whether Congress needs to legislate on the issue. At first blush, "this would require a national decision but it could be all taken care of by prosecutorial discretion," he says. "It is a state and federal conflict and it's one we don't need."